What Are The Best Food Processors For Baby Food In 2019? Last Updated: 10 April 2019 - This post contains affiliate links. Making your own baby food at home can be quick, easy and very cost effective if you have the right equipment. Funnily enough, not all food processors are ideal for baby food so before you buy just any old machine, take a look through our list. There are a few options out there, from food processors, to stick blenders to baby food makers. Which one is best really comes down to what you require, your budget, your storage needs and how versatile you want your appliance to be. We’ve put together a list of different options, all of which are fantastic for making baby food. Some are baby food makers, some are stick blenders for travel and some are good old multi-purpose food processors. 1 What’s the difference between food processors, blenders, baby food makers? What’s better for your needs? 2 Is making baby food with a food processor better? 3 What are the best baby food processors by type? What’s the difference between food processors, blenders, baby food makers? What’s better for your needs? Have you ever used a blender and found that the food gathers around the sides, leaving the blades whizzing around without actually blending anything? That’s because many blenders are best for wetter, more liquid-based foods such as smoothies. Food processors tend to have wider-reaching blades and a more conducive shape to blending dryer or more solid foods like steamed veggies and cooked meat. You can also control the consistency and “chunkiness” of your baby food a little better too. Food processors are also easier to add ingredients, liquids and seasonings as you blend as they have a chute to pass them through. What’s more, most food processors can handle hot ingredients, while many blenders are a no-go zone for hot foods. If you’re getting your baby food done in a pinch of time, you don’t want to waste time waiting for hot meats and veggies to cool down. In terms of versatility with baby food, I’d go for the food processor. Baby food makers generally have a steaming function as well as a puree function. Food processors are purely for blending, pureeing, chopping and pulverising foods to various consistencies. To be honest, you don’t need to feel like you need to invest in a baby food maker, even if they are affordable. There are many great food processors out there which can do the job just as well. The difference is that you have to cook the food before you pulse it. This might sound like more work, but it’s simple to steam food either in a steamer basket or even the trusty old microwave. In terms of long-term use, food processors are great as you can use it long after your little one starts to eat “big kid” meals. However, baby food makers have their merits too. Busy parents who’d prefer to do each process all in one machine are well suited to baby food makers. They also tend to be quite compact and easy to store. If you have lots of little ones, or you know you’re going to have more in the future then a baby food maker could be a great choice for you. As you can already tell, there are no set rules, it’s all about your personal needs and which appliance is going to make your life easier. Is making baby food with a food processor better? Food processors tend to have wider-reaching blades and a more conducive shape to blending dryer or more solid foods. You can control the consistency and “chunkiness” of your baby food a little better too. They also tend to have a large capacity than blenders, so you can make larger quantities of baby food at one time. If you need something to handle hot, cold, dry and wet foods then yup, a food processor is a smart purchase…if you pick a good one. That’s where we come in to help. What are the best baby food processors by type? These models are more along the baby food maker line as they offer steaming and blending all in one. While some people do find a blender to be the best for baby food, sometimes a multi-tasker is just the way to go. These 3 models are all BPA-free and very safe for babies and toddlers. This is a great choice for parents who have limited time and limited counter space. It can steam, blend, reheat and defrost. Most people have been thrilled with this model, but have quick scan of the negative reviews too, as a small number of people have experienced a few issues. However, it is an all-around great baby food maker at a reasonable price (around $150). A similar machine to the Beaba at a far cheaper price (around $70.00). A compact, petite little machine with 4 functions: steam, defrost, reheat and chop/puree. It’s designed to be nice and quiet so as not to disturb any sleepy little ones. This is an even more comprehensive model than the previous two. It has an auto-clean function, a disinfect function and an auto-blend function. It’s pretty cost-effective too, at around $100. It can handle all foods and makes super-smooth puree or chunkier mixtures for older bubs. Okay, so you’ll notice that the models in this section are technically good old immersion hand blenders. The reason they’re in this list is that they’re super easy to take when travelling. They’re slim, compact and can be tucked neatly into the sides of suitcases. The blending jars, cups and blades just need a quick rinse and air dry. with a powerful blade and a lid for the 3-cup blending jar. It also comes with a chopper attachment for chopping up harder foods for snacks for older kids. For travelling, you can simply take the blender blade, handle and blender jar. Rinse them out, give them a quick try then stash them back into your pack or car. A super affordable model ($40 give or take) you can keep stashed in your car, cabin or anywhere else when you need to make baby food away from home. It has 6 speeds and a turbo speed for achieving any baby food consistency from chunky to the smoothest puree. 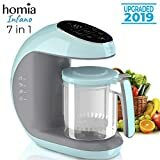 Comes with a separate food processor for blending chunkier foods for when baby gets a bit older and can handle larger pieces of fruit and veggies. 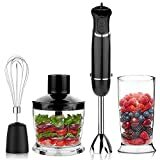 12-SPEED - This hand blender with 12 Speeds + turbo function, quickly blends endless culinary delicious. 304 STAINLESS STEEL BLADE - The blade is sharp, it can make the delicious food in the shortest time. 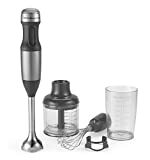 2-YEAR WARRANTY - This hand blender comes with 2-Year warranty, Dishwasher Safe. These models are all cheap but of a very high quality. Hamilton Beach is a fantastic brand, as is Cuisinart, so you’ll be in good hands even though you’re getting a total bargain. 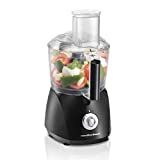 This food processor is effective and very easy on the wallet ($40 but if you get it on sale it can be lower than $30). You can blend cooked foods to a smooth, pureed baby food easily. You can also use the slice/shred disk for when you want to make slightly larger pieces of food for growing toddlers. A tidy little food processor which fits neatly on small benches with little space available. Great for storing away then pulling out to use whenever a fresh batch of baby food is due. It’s versatile as it can puree soft foods and chop hard foods once baby gets a little older. A really highly-rated food processor at a very pleasing price (generally no more than $60). 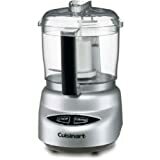 It has sturdy stainless-steel blades for blending soft foods to the smoothest puree. You can also chop harder foods such as nuts as the blades are more than strong enough. If you need a chunkier baby food you can use the pulse button to control the consistency. Do you need an all-in-one or would you rather steam the ingredients “manually” first? Would you like to use the appliance for other, non-baby related tasks? Would you like to use the appliance for child-friendly foods as your baby grows? How much counter space or storage space do you have? Do you need to travel with your appliance? Once you’ve answered those questions, the decision will be narrowed down and you can land on the perfect appliance for you and your baby. As long as the appliance is well made, has strong blades, can handle different kinds of foods and temperatures then you can’t really go wrong. Always scour the review sections for products before you buy them, as there’s no-one more honest than a scorned or delighted consumer. We hope this guide helped, good luck! What Are The Best Nutribullet Blenders On The Market In 2018? This review has been contributed to by multiple members of the HBS Review Team to ensure the highest standard of quality.